Last year I became a Founding Member of KeyNote – Asia’s Women Speakers. 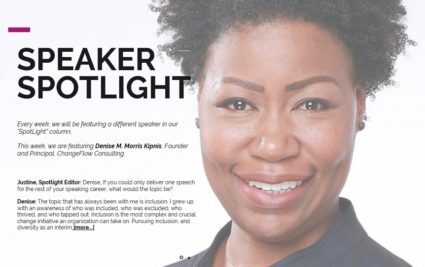 KeyNote is a new initiative by the PrimeTime Business and Professional Women’s Association, and it has two primary objectives: to lift up women who are already speaking at a professional level and to incubate the next wave of powerful women speakers. For me personally, being a part of KeyNote means reaching back to help others join me at the front of the room; and crystallizing and promoting my gifts in ways I wouldn’t normally. I was invited to step into the Spotlight. KeyNote edited the interview for brevity on their Web site; I’m posting the full version below. As told to Justine Pierce, January 10, 2018. If you could only deliver one speech for the rest of your speaking career, what would the topic be? Why? The topic that has always been with me is inclusion. I grew up with an awareness of who was included, who was excluded, who thrived, and who tapped out; and the missed opportunities and misunderstandings that could have been ameliorated. And events of the past two years have made it really very clear to me that not enough people know what inclusion means. Or if they know, they have been allowed to back away from it. I am first and foremost a change agent. I will always run towards change. Inclusion is, arguably (actually, I’ve not met anyone who would argue against this) the most complex and most crucial change initiative an organization can take on. Because it goes beyond the spoken rules, beyond the usual emotional processing that people exhibit in the face of change. Pursuing inclusion, and diversity as an interim step, requires getting at what people truly believe. What they believe about themselves, about other people, about the world; what they stand for. And can they let some of that go so, to allow for others possibilities, for the sake of the organization’s success, people development, and other outcomes. Inclusion can’t happen through policy or process alone—it requires real systemic organizational transformation. And it’s a lifelong commitment, not a fad. And you start like you start anything: one day at a time. In 50 words or less, tell us your “big idea,” meaning what is the topic you most passionately want to share with audiences? Diversity is organizational effectiveness. This was the title of the first presentation I gave of my thesis work. Simply put, research and experience support that learning from and adapting differences is a key differentiator for organizations aiming to be agile and sustainable over time. What is your favorite part about speaking? Honestly, speaking is not my favorite thing. I worry that what I say won’t be original, that we’re all exposed to a glut of content, most of it regurgitated, and I don’t want to be seen as contributing to the noise. But I believe in feedback, and the feedback I’ve gotten is I do have a unique and interesting point of view. So now it’s a matter of managing to my strengths. I work best in interaction, in dialogue, in the exchange of ideas. When there is a live problem or, as they say in Design Thinking, a messy, indeterminate situation that needs solving. I work best when I can think, design, act, and implement from a systems perspective. I live for the moment after the breakthrough. When people go back to their desks, how has the system shifted to support them in behaving differently? How do we keep inertia at bay? That’s where my superpowers kicks in. When I take on a speaking engagement, I factor in whether there is an opportunity for something more than awareness building, or inspiring people. I look for the likelihood of real change. That’s my favorite part about speaking.